Beatrice Webb’s observation that poverty has little to do with individual sloth and everything to do with economic mismanagement and social structure led to systematic government action to regulate society and to reduce poverty. It is now clear that Beatrice’s analysis, made 100 years ago, needs to be updated to embrace our entire ecology and our responsibilities to the planet. For poverty reduction to be successful in the 21st century we need to address a broader range of issues. These were considered at the Edge Funders Conference held in New Orleans from 17 to 20 April 2018. ‘Come to the edge’ was the invitation, and 200 came. The premise of the Edge Funders Conference held in New Orleans from 17th to 20th April 2018 was that from the edge you can see all sorts of things that you can’t see from the centre. Barry Knight is the author of Rethinking Poverty: What makes a good society? The discussion lived up to its billing. There was consideration of many issues not normally considered at philanthropy conferences: ‘vivir bien’; ‘degrowth’, ‘the commons’, ‘ecofeminism’, ‘the rights of Mother Earth’, and other topics designed to foster social justice and peace. The conference was held at a place that is not only metaphorically on the edge, but physically so too. New Orleans is gradually being lost to a rising sea where an acre of land falls into the Gulf of Mexico every hour. The way we are exploiting the New Orleans region is an emblem for all we are doing wrong in our world. While destroying a beautiful environment, ‘Cancer Valley’ – the 85-mile stretch between Baton Rouge and New Orleans that is home to more than 150 plants and refineries – brings early death to countless people who live there. While people may be dancing in the street in the French Quarter, they are also dancing the dance of lemmings on the edge of the cliff. People from New Orleans at the conference said that ‘another gulf is possible’, but would require a complete turnaround in how we do things. The same is true of the rest of the world as we sit on the edge of ecological disaster. The commonest phrase used at the conference was ‘systems change’. A large diagram on the conference wall set out an outline structure of what needs to done to bring social and economic transformation based on global justice and ecological principles, rooted in place, culture and community self-determination. There was agreement that philanthropy has too few resources to make the turnaround, but could make a great contribution if only, as conference co-chair Amanda Gigler put it, if philanthropy was not so shy about being bold. Philanthropy for Social Justice and Peace (PSJP) has been saying for years that philanthropy punches way below its weight and, if could break free from its risk-averse mentality, could provide the foundations for a new world order. The solution, suggested by Jayessha Dutta at the conference, involves ‘decolonizing philanthropy’. Philanthropy can use its power to provide the energy for structural transformation. Part of this involves personal transformation, and the Edge Conference provided a safe space where funders could be fully human. The question arises about how to get leverage. This is an enormous problem because the problem is so vast. In a plenary address, Pablo Solón said that we cannot opt for a single approach and must find answers to a variety of bad practices – including capitalism, extractivism, plutocracy, anthropocentrism and patriarchy – and join them up. Thinking how to do this induces an oceanic feeling in me about what might be possible alongside discomfort about how to get started on this. One promising initiative was highlighted at the conference. This is the Global Engagement Lab in which funders from around the world join a six-month process of learning and collaboration to build philanthropic strategies for supporting systemic alternatives. The group focuses on themes ranging from explorations of agroecology and food sovereignty to notions of buen vivir and municipalism. Starting with broad thematic areas such as these, they dig deeper with networks of peers, activists and civil society experts to enhance understanding of theoretical frames and to explore concrete, real world practice in different contexts. The question left hanging in my mind at the end of this conference is how to get more people out to the edge? While on the edge, we will see that, not only is another world possible, but that we must also move beyond our established categories of thought and narrowly defined programs of action if we are to achieve it. 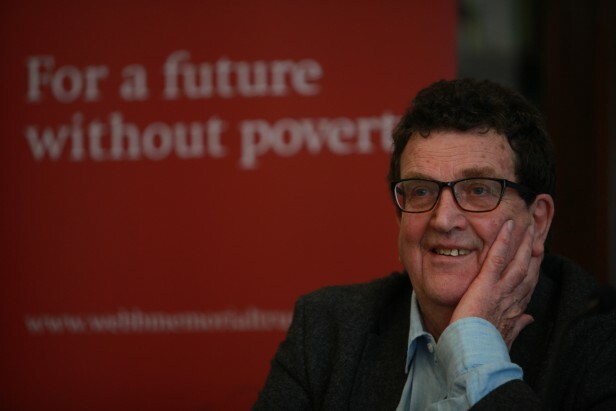 Barry Knight is the author of Rethinking Poverty: What makes a good society? and former director of the Webb Memorial Trust. This article was originally published by Alliance magazine on 26 April 2018. The original article can be found here.